This symposium brought together stakeholders from the rice supply chain including growers, researchers and processors to discuss factors affecting rice quality and to develop a plan for future investment in research. Download a copy of the program here. 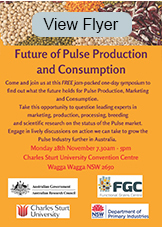 A very successful Pulse Symposium was held in November at Charles Sturt University Wagga Wagga Campus to coincide with the 2016 International Year of the Pulse. The day commenced with an informative field walk hosted by NSW DPI and was followed by a fantastic array of diverse and interesting speakers on new discoveries in growing, processing and the future of marketing. 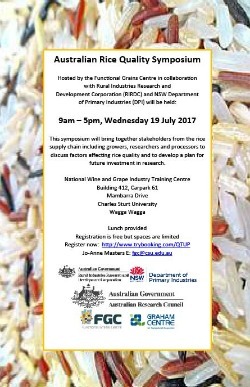 Pulses are great for our health and for the soil so this was an important event for anyone with an interest in Health, Grain Science or Growing. Copies of presentations are available below in PDF format. Should you be interested to learn more, please email fgc@csu.edu.au.